Two weeks ago, I’d arrived back from Stewart Island feeling lost without my birding compadres. Not knowing what to do with myself, I began planning for the eBird Global Big Day which was to be held on may the fifth. The eBird Global Big Day is an event held each year in May in which people all around the world go out and spend 24 hours trying to see birds. Some people just eBird from the house, while others undertake huge voyages chasing immense records. As the event is organised in America, it unfortunately clashes with the first day of duck-shooting and is in our Autumn, so the Arctic migrants have mostly left. This makes the event harder to plan, but I still wanted to do something big. 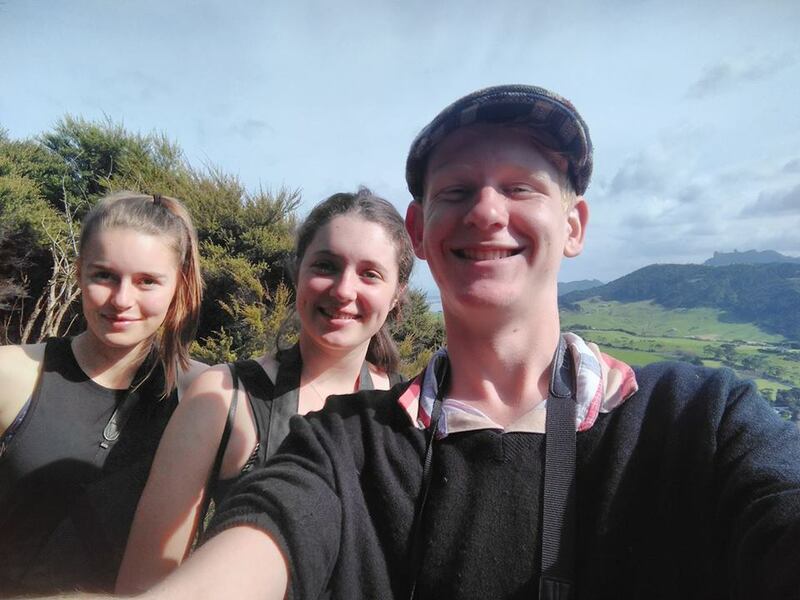 So I jumped on my phone, and began chatting to Dayna Davies, a young birder from Tutukaka about going for the Northland big day record. We invited Adi-Grace Mooar from Raglan and Charlie ‘Steve’ Thomas from Orewa. Unfortunately, Steve had to pull out at the last moment due to tonsilitis, so it was just Dayna, Adi and I going after that record. The Northland record stood at 74 species, held by David Howes, Russell Cannings and David Thomas. This meant that a huge amount of planning would be needed to take the title, and so I knuckled on down with a 1B5 and started writing. Then, on Friday last week, Adi and I clambered aboard our Intercity coach from Hamilton to Auckland, enjoying a day off school for the sake of the seeing birds - dream life! We had a brief wait in Auckland, before catching our service northward to Whangarei. At 7:05, we finally rolled into town and met-up with Dayna, and her mother Wendy. A brief drive back to Tutukaka, and we resumed planning and discussing for the day ahead. The next morning, my alarm of Blue Danube Waltz sounded at 5:30, and we ‘leapt’ into action. A top-notch breakfast of Weet-Bix and tea had us rearing to go. I popped the bathroom, and upon coming out to wash my hands heard a loud “SKARRRK”. I ran out of the house to the sight of five Kaka wheeling overhead - what a way to start the day! By the time we’d left, we had five species under our belt and were ready to get far, far more. We pulled into Tarawhata, a headland just north of Tutukaka at ten to seven, and the birds kept flowing! The main reason we’d come here was the view over the sea, but winds prevented anything exciting. Good numbers of Fluttering Shearwater and five Buller’s Shearwater were feeding just offshore. There was a single Dunnock calling, and we began to tick off most of the common passerines. From there it was off to Ngunguru Sandspit, which we pulled into just a tick after eight, and the good birds quickly started rolling in. Such excitements as Mallard, White-Faced Heron, and Skylark were complimented by two Reef Heron and four New Zealand Dotterel. From there, we’d planned to go to Ngunguru Sewage Ponds, but lo and behold, of course we had picked the time the farmer was moving his cattle right along the path. Discontent with wasting time waiting, we changed tactics and headed to Lake Waro. Lake Waro is a well known Scaup lake in Northland, but for the eBird Big Day they had made an exit. We did, however, add Peafowl, Dabchick and Coot, among other species. We moved south to Peach Cove Track on Bream Head. Whilst we were behind schedule, we knew we could make up the time that afternoon when we wouldn’t have to drive to Lake Waro. We had Spoonbill, SIPO and Pied Stilt from the car as we rounded the north Whangarei Harbour. The bush at Bream Head, however, was shockingly quiet. Dayna and I heard Bellbird, Tomtit were common and there was one brief encounter with three Whitehead. The regular Robin, however, was not to be found. Time was of the essence though, so we had to kiss our robin chances goodbye and hit the road. Next stop was Papich Road, where we quickly located the sewage ponds at the back of the track. These revealed 164 Paradise Shelduck, 6 Grey Duck, 55 Mallard, 18 Grey Teal, 19 Little Shag, 2 Little Black Shag and 5 Caspian Terns. After a thorough search for anything odd in the ducks, we left to find the Industrial Estate. A drive-by looking for the local dotterel flock failed, however, and so we pushed up to Wilson Dam. Here, we found Black Swan, 29 Paradise Shelduck and a Dunnock. The high duck-shooting activity on the lake appeared to have scared off the resident Canada Goose, much to our disappointment. Our next stop was Ormiston Road, now 1:45 in the afternoon. Much to my delight, we were rewarded with gorgeous views of Australian Little Grebe, as well as more Pacific Black Duck and Dabchick. A half-hour stop at Waipu gave us Brown Quail, Banded Dotterel and Bar-Tailed Godwit, as well as good numbers of Variable Oystercatcher (85), Fluttering Shearwater (18) and NZ Dotterel (17). A few stops on the way back up to Ngunguru Sewage Ponds added little, though we did get Barbary Dove in Whangarei. The Ngunguru Sewage Ponds (the third sewage ponds we’d visited that day!) had 40 Brown Teal and 16 California Quail, both handy birds for the day list. It was half-past five by the time we pulled into Old Mill Lane, which is a marshland in Tutukaka. Almost straight away we added Fernbird, and slightly further along the boardwalk we got Spotless Crake and Banded Rail. Time was not on our side anymore though, as we were now sitting on 68 species and the sun was fast setting. We raced around trying desperately to find Kukupa (or Kereru to those south of Auckland), but failed. As darkness set, we headed back to Tarawhata, where we added Morepork and Grey-Faced Petrel to our day list. The Grey-Faced Petrel were awesome, as heaps of them squaked and whistled from the forest floor in pitch black. Now a little hungry, we headed off for pizza and a brief break from birding. We were now on 70 species, and the record seemed to be just slipping from reach. Determined, we struck out for Matapouri in the hope of Little Blue Penguins coming ashore. We dipped. Desperate, we tried Sandy Bay for Barn Owl. We dipped. We raced to Old Mill Lane - our last chance. To our relief, two North Island Brown Kiwi were rustling at the end of the boardwalk. On 71, the record was still just beyond reach. We had no luck attracting Marsh Crake or Bittern, and so walked out just four species short of holding that Northland record. Despite missing out on the title, we all really enjoyed our big day. We also know that when we try again in Summer, this route has all the potential to cross the line - watch this space!